Gum recession is a condition in which your gums pull back from the tooth surface, revealing the root surfaces of your teeth. It’s just one form of gum disease. A recession of the gum arises as a result of unsatisfactory oral hygiene or dental diseases. It leads to abundant dental deposits and the development of various gum diseases. There are a variety of treatment methods for gum recession. If you have gum recession, contact the Burbank dentist Dr. Sahakyan as early as possible. The earlier the gum recession is diagnosed and treated, the better the results are. Plaque and formed stone. These signs eventually lead to the movement of the gums. Malocclusion. This pathology leads to a violation of blood circulation. The recession always manifests itself with an open and deep bite. Bared roots can also be observed with wrong turns of teeth and crowding. Aging of the mucosa. Because of this reason, a recession of the gums is often observed in the elderly. Wrong care. Unstable and wrong hygiene rapidly intensifies the recession. Overactive and uncareful cleaning of the oral cavity can damage the gums. Injury of soft tissues. Due to mechanical damage, dislocation of the tooth and its movement to the wrong position can occur, which undoubtedly will lead to a recession. This happens mainly as a result of prosthetics. If the crown is not set correctly, it will hang over the tooth and will injure the gum. Unprofessional tooth extraction also provokes the described disease. Anatomical reason. This is a deviation from the norm. The anatomical structure of the tooth has a massive root and a thin layer of cortical bone. Because of this pathology, the blood can not flow normally through the vessels. Because of the bad blood flow, the gum begins to react to the slightest external stimuli and is easily susceptible to the influence of microorganisms. Even minor vascular damage leads to serious abnormal defects. Wrong orthodontic treatment. Incorrect method of installation of structures leads to pathologies. 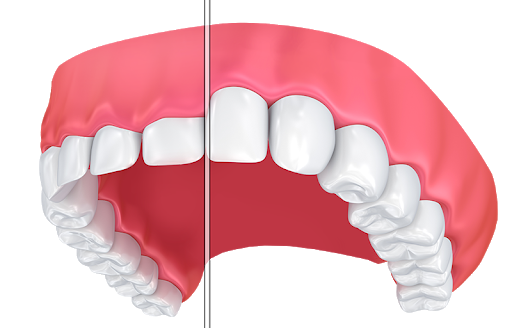 When serious pressure is applied to the gum, the teeth are shifted in the wrong direction, the gum becomes thinner. Serious inflammatory process. Gums can also be damaged as a result of the inflammatory process. Under improperly installed orthodontic devices, a dangerous plaque can form, which quickly leads to the onset of the inflammatory process. Painful and uncomfortable sensations when eating. 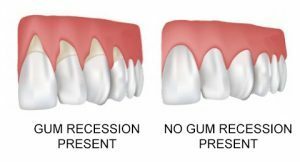 The gum recession needs to be treated as soon as it gets noticed. If no action is taken in time, the pathology will worsen and lead to serious consequences such as loss of teeth. Consultation with the Burbank dentist is recommended at the appearance of the first symptoms and signs of the disease. Only a good specialist can stop the descent of the gum tissue and further exposure of the roots of the teeth. If you have problems with gums, please call 1-818-578-2332 or contact our dental office today. Burbank dentist examines the patient and assesses the condition of teeth, gums and the mouth as a whole. He also conducts a survey to determine the cause of the problem. If necessary, the patient is sent for an additional examination. As an additional study, an X-ray is prescribed that helps to identify the stage and extent of the inflammatory process. If the examination is diagnosed as gingivitis or periodontitis, the patient is assigned a blood test. Surgical treatment consists of closing the exposed area with adjacent soft tissues. It is done to stop the loosening of the teeth. Therapeutic or remedial treatment assumes that the inflammation is eliminated by prescribing anti-inflammatory and antibacterial drugs to the patient. In addition, the dentists seek to improve blood circulation in the gums. They saturate the gums with oxygen and improve their ability to regenerate. If necessary, cosmetic methods of closing gummy areas of gums are also prescribed during therapeutic treatment. 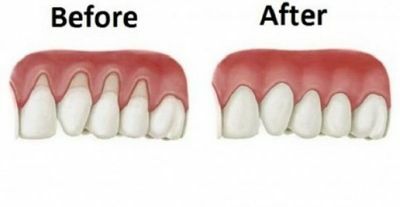 How quickly the gum treatment will give a positive effect, depends on the specifics of each case, as well as on how complete and well the patient follows the recommendations. If the patient asks for help on time, the problem can often be solved easily and completely. Try not to injure the oral cavity. 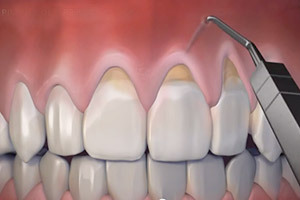 Carry out early diagnostics of the cavity. Stop the inflammatory process on time. Monitor the standing of the oral cavity during pregnancy. Carry out regular hygiene measures, do not forget about the significance of a good oral hygiene. Completely refrain from smoking, nibbling nails, and other solid objects. Use dental floss and brushes correctly. Use a medium hardness brush. Try to use electrical brushes, which themselves regulate the pressure on the teeth. With any suspicion of the disease, you need to rush to the dentist. Talk to the Burbank dentist, Dr. Sahakyan about the health of your gums and he will be happy to advise you. Getting regular dental checkups, maintaining proper hygiene, and avoiding bad habits like smoking will raise the chances that your gums remain healthy for a long time. If you have any questions, please call 1-818-578-2332 or contact our dental office today.